There is actually a ramen museum called the Shin-Yokohama Rāmen Museum, which unfortunately, I did not get to visit while I was in Japan. You may only think of ramen as a quick cheap meal consisting of water, dried noodles, and a sodium rich seasoning packet. However, authentic ramen is complicated to make and there are a lot of different types of ramen bases. Shio Ramen is a salt-based broth. Miso Ramen is a miso-based broth. Tonkotsu Ramen is a pork bone-based broth and Shoyu Ramen is a soy sauce-based broth. Each broth also calls for certain toppings. 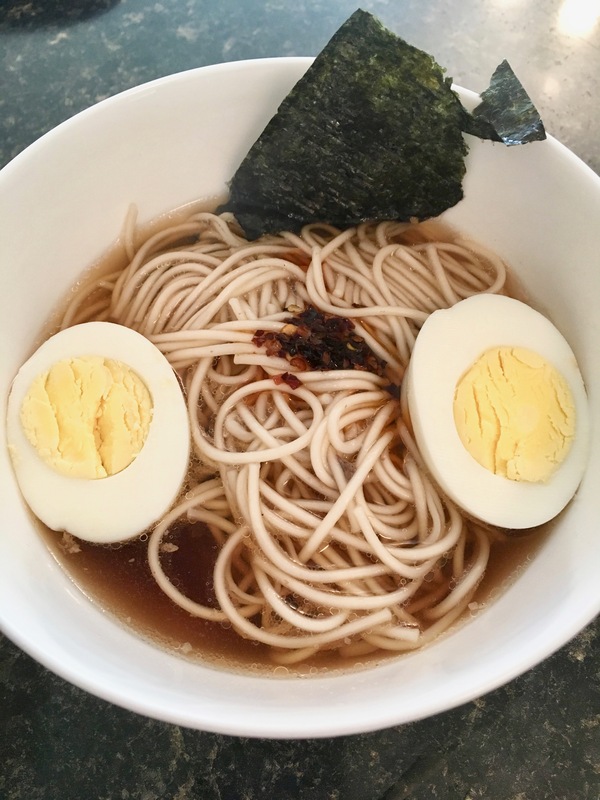 I wanted a homemade ramen recipe and every one that I found was really complicated. Also, I am kind of lazy. Then I remembered, I have a big bag of instant ramen seasoning packets in the cabinet. The reason I have a lot of ramen seasoning packets is because when my husband makes instant ramen, he makes two packages, strains the noodles, adds butter, and sprinkles one of the two seasoning packets on top. Thinking someone on this earth had to be as lazy as me and keeps their unused ramen seasoning packets, I searched the internet looking for ramen (with toppings) recipes using these packets. I did not find one so I decided to improvise. My ramen was not authentic or exclusively Japanese. It was also not healthy, but it was delicious. Place a slow cooker liner bag in slow cooker. Place pork shoulder in slow cooker and add beef broth. Once your pork shoulder is done, remove from the slow cooker and place on a plate to cool. Place a colander over a large bowl, pour liquids from slow cooker liner bag through the colander. You will use this liquid to boil the noodles. Once pork is cooled, break into pieces and remove fatty parts. Boil the eggs. Allow to cool and remove the shells. Fill a pot with 1-1/2 cups chicken broth and 4-1/2 cups water. Heat over medium heat and add seasoning packets. In a pan or wok, add sesame oil and heat over medium heat. Fill a large pot with slow cooker liquids and 3 cups water. Start bringing to a boil. Once pan or wok is warm, place pork in a thin layer. Allow to sear on one side. Once water in large pot comes to a boil, add noodles and cook according to package. Turn pot with seasoned broth down to low heat. Flip pork over to other side or if using a wok, lift and shift pork around. Once noodles are done, drain. Cut nori sheet into pieces. Divide seasoned broth into four bowls. Add noodles (unless you want to dip noodles instead), pork, egg slice, nori, and 1/2 teaspoon of hot chili oil to each bowl. Drizzle with soy sauce if desired.